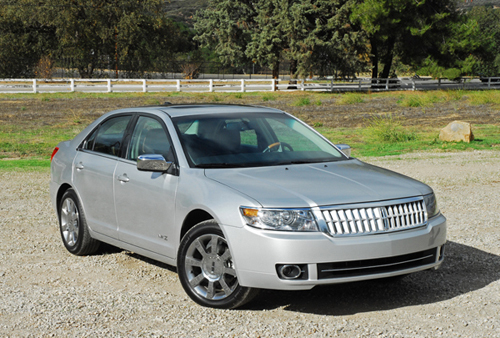 After a successful launch in 2008, the 2009 Lincoln MKZ continues setting new standards for entry-level luxury sedans by offering a new interior design treatment that smartly blends basic black with MKZ’s sophisticated Lincoln styling and richly appointed interior. The new Midnight Black MKZ Special Edition package includes a black-themed interior with satin nickel and chrome accents, including large pieces of light-colored, real maple wood inserts on the dashboard, instrument panel, steering wheel and door trim. Black, premium-leather-perforated front bucket seats up front and rear seating surfaces are trimmed with contrasting piping and have the Lincoln Star is stitched into the head restraints. 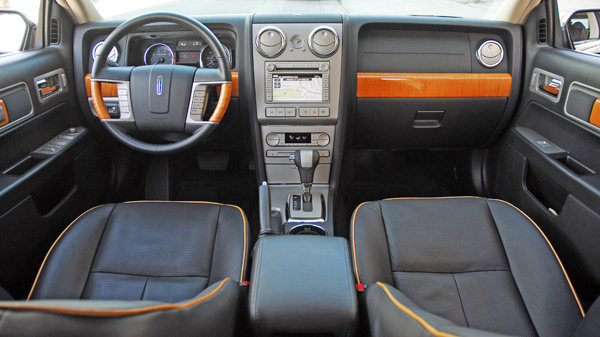 This new package adds even more luxury, comfort and refinement to the MKZ’s already excellent interior. I really enjoyed the more comfortable and supportive front buckets, and who doesn’t like butter-soft, premium black leather. 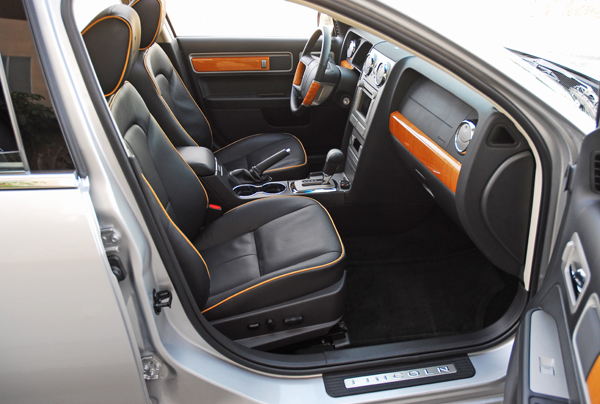 Black dashboard and door trim pieces are all high quality with a soft-touch. 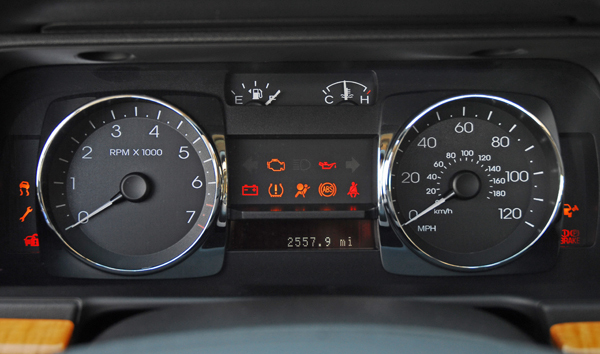 The chrome-ringed instrument cluster is easy to see and understand. The brushed nickel center stack features Lincoln’s signature clock and easy to use dials and buttons. All are fully illuminated for safe nighttime driving. A serious contender in the entry-level, mid-size, luxury segment, the new 2009 MKZ boasts a number of best-in-class interior features and award-winning technologies that treat consumers to levels of comfort and convenience at a value in the segment. These features include SYNC-Ford’s industry-exclusive, voice-activated hands-free, in-car communications and entertainment system. It was developed in collaboration with Microsoft, and fully integrates mobile phones and media players into the vehicle using Bluetooth technology and USB connectivity. You’ll also find an optional touch-screen, voice-activated navigation system; standard SIRIUS satellite radio; the Reverse Sensing System assists you with rear parking by sounding an audible gauge of distance from objects in the rear; First-In-Class standard 10-way power front bucket seats with two-driver memory; First-In-Class standard climate-controlled front seats that provide climate-controlled heating and A/C with butter soft, perforated leather seating surfaces; Best-In-Class interior space with best-in-class rear seat legroom for comfort and ease of entry for rear passengers (all four-doors have grab handles above); Class Exclusive standard 60/40 split rear seat is as functional as its form, and MKZ excels at each with the inclusion of the easy-to-use, rear spring-assisted, split bench seat that allows for greater trunk storage when necessary; and finally, the largest trunk in its class with 15.8cu.ft. of storage space. Topping off this comfortable and luxurious interior is the available, award-winning THX II audio system that uses the latest in patented THX technologies to bring the home theater surround sound experience to the open road. The system uses a 12-channel amplifier to deliver 600-watts of power to a total of 14-speakers, including two subwoofers, strategically placed in the cabin. The system’s processor analyzes bandwidth, peak audio levels and coverage uniformity to deliver a smooth spectral balance and wide dynamic range. Multi-channel equalization and digital signal processing match the speaker placement to the cabin acoustics to assure this high level of performance. With the push of a button, the system can be configured for three specific listening modes-Driver, Front Seats and All Seats-ensuring that all passengers enjoy optimal sound. The system also features a fast-loading six-disc changer that reads CDs in normal audio, MP3 compressed or text formats. The AM-FM tuner is compatible with the Radio Data Broadcasting System (RDBS) and displays participating radio station call letters, formats and song titles. Sound-deadening materials are placed strategically around the cabin to keep outside noise to a minimum to more fully enjoy the sounds. The unitized welded steel body and chassis uses high-strength steel and aluminum for added torsional rigidity and stiffness, resulting in less noise, vibration and harshness (NVH). 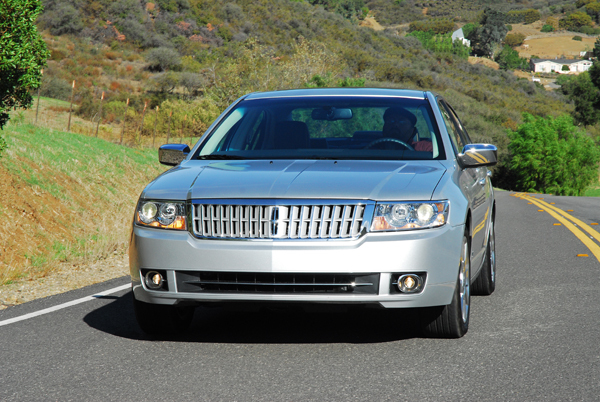 The exterior styling is understated but pure Lincoln in heritage with the signature Lincoln chrome and aluminum grille, well-formed headlamp clusters behind clear lenses and available with HID lamps, a lower air-intake surrounded with a chrome strip that helps channel cooling air into the engine, a lower-bumper with integrated round fog lamps that are optional but highly recommended for safer nighttime driving. The aluminum hood is tightly drawn over the engine bay and features four tasteful creases. The rear glass falls gently into the high-mounted trunk lid that features a large Lincoln Star in the middle with two uniquely styled, wrap-around, LED lamp clusters at the sides. Just below the rear bumper are chrome-tipped, dual exhausts nicely spaced apart. The silhouette is very sporty with steeply raked windshield ‘A’ pillars, flared fenders, aero-styled side-view mirrors, and lower side extensions. The beltline features a wide chrome strip. The flared fenders are stuffed with 17X8in. 8-spoke machined & painted aluminum alloy wheels that are wrapped with 225/50VR17in. high-performance all-season tires. These tires were chosen to match the fully-independent suspension tuning. 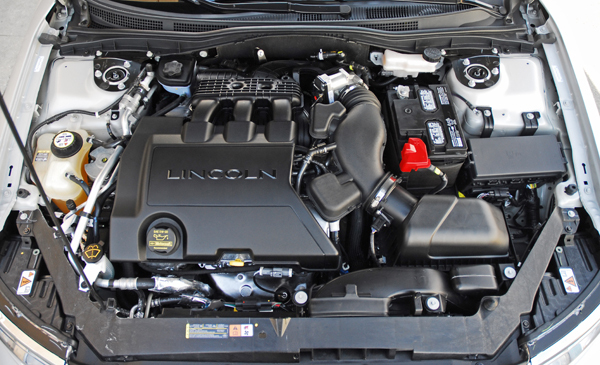 Power is generated by Ford’s Duratec 3.5 liter DOHC, all-aluminum, VVT V6 engine that generates 263hp and 249lb.ft. of torque. That’s plenty of power to easily maneuver around slow city traffic, to merge easily, and pass slower moving vehicles on the freeway. 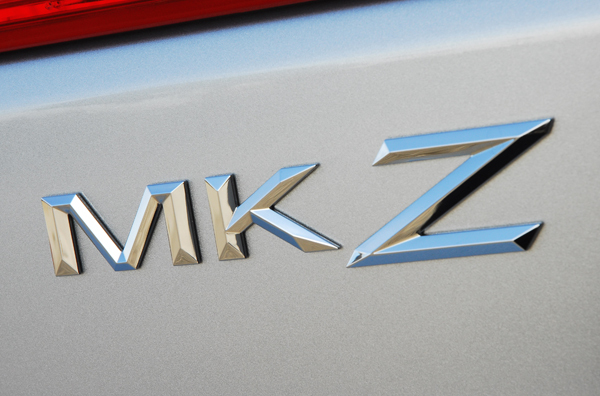 The MKZ can quickly respond to your inputs thanks to the premium six-speed automatic transmission. A torque-based electronic throttle control works with the electronically controlled transmission by adjusting throttle plate movement to tailor torque to the timing of each shift enabling the transmission to deliver smooth, barely perceptible gear changes. The MKZ gives back an engaging, performance driving character thanks to the careful engineering and calibration on the chassis, steering boost curve, coil spring rates, 24mm front/18mm rear anti-roll bars, and damping force of the front short/long arm (SLA), and rear multi-link suspension. The rack & pinion steering system is right-on with feedback from the road and excellent on-center feel. 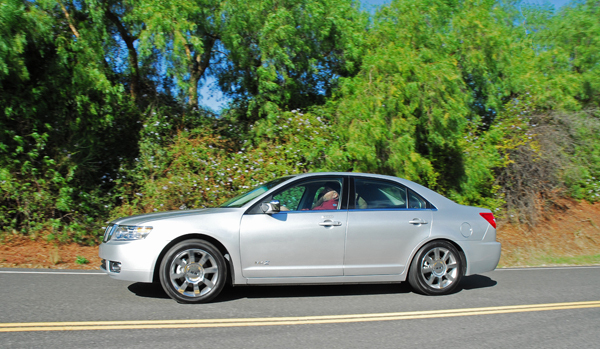 Utilizing the car’s stiff structure, the MKZ mounts the steering gear to the front perimeter subframe for reduced NVH. This setup allows you to better experience the car’s relationship to the road via the steering wheel, whether you are parking or driving at high-speeds. 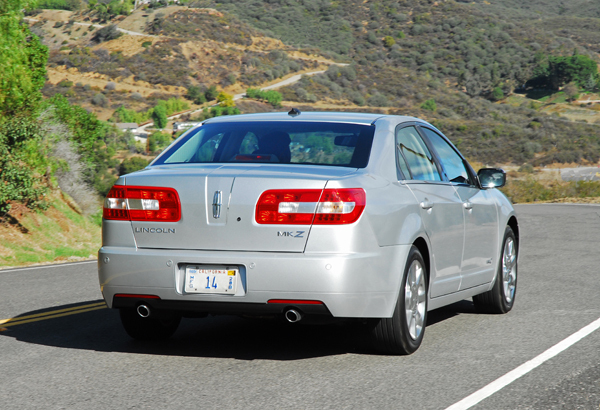 The MKZ comes with standard front-wheel-drive and optional all-wheel-drive. The intelligent AWD system is tuned with an emphasis on luxury performance and confident all-weather driving. The system actively and seamlessly delivers torque to all four wheels, even before wheel slippage occurs. An active on-demand coupler delivers the precise amount of torque needed to the rear wheels. Paired with standard traction control, intelligent AWD can transfer torque front-to-rear and side-to-side. The 2008 MKZ that I tested last year came with AWD and I would highly recommend it if you live where the winters are snowy. 4-wheel disc brakes. Up front are 11.9in. vented discs clamped with dual-piston calipers, and 11in. solid discs clamped with single-piston calipers, in the rear. Braking control and stopping distance is enhanced with standard ABS and electronic brake force distribution (EBD). The MKZ comes with a number of highly advanced safety technologies, including standard AdvanceTrac electronic stability control. AdvanceTrac can predict the vehicle’s intentions using a sensor to detect and measure oversteer and understeer by monitoring the vehicle’s steering wheel angle versus actual yaw. When the system senses wheel slip-the difference between your intended and the actual path-engine torque is reduced and braking is applied at individual wheels to help keep you tracking safely on your intended path. You can off course shut the system down so it doesn’t get in your way during spirited driving, or when you are in need of wheel slippage in certain situations. Additional standard safety systems include front/side airbag protection up front and air curtains for both first and second rows; Ford’s personal safety system which includes safety belt pretensioners, load-limiting retractors, driver-seat-position sensing and crash-severity sensing; Ford’s Belt-Minder system that chimes for six seconds every 30-seconds for five minutes or until the driver buckles up, which ever comes first; and LATCH lower anchors and tethers for child seats. Standard MKZ features not mentioned above includes intermittent speed-sensitive wipers/ dual-zone electronic automatic temperature control, auto lamp on/off delay head lamp controls, cruise-control, dual map lamps, sunglass holder, front center console with dual cup-holders, two-tier storage bin and armrest, map pockets behind both front seats, HomeLink garage door opener, power-adjustable/heated sideview mirrors, power windows/express up/down in front, power door locks, manual tilt/telescoping steering column, leather-wrapped steering wheel with redundant audio and cruise control buttons, rear seat reading lamps, rear flip-down center armrest with dual cup-holders, and tire pressure monitoring system. Options not mentioned above include power moonroof, a self-dimming rearview mirror comes with the DVD based navigation system. After a week test drive I was impressed with the smooth, cut-from-a-block of metal styling, power and performance along with an interior that features state-of-the-art automotive high-technology convenience and entertainment with luxurious features not found in other mid-size, entry-level sporty luxury sedans. The base price starts at a reasonable $32,155.00, and $38,190.00 fully loaded. Front Head Room: 37 in. Front Shoulder Room: 57 in. Rear Shoulder Room: 55.6 in. Rear Hip Room: 53.6 in. 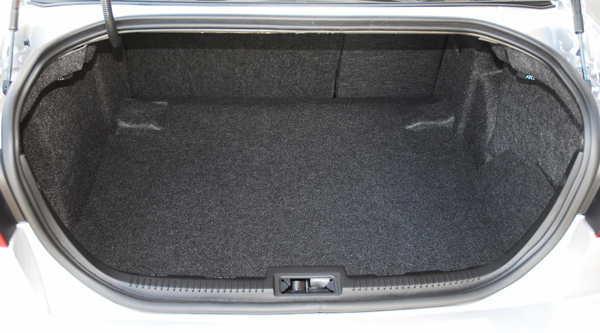 Rear Leg Room: 36.7 in. Automatic: 297.5 mi. / 420 mi. / 332.5 mi.